I am a quick learner and always motivated. 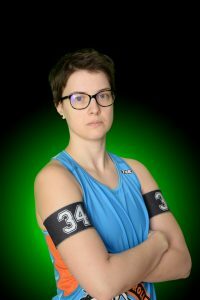 Derby crush (who inspires you and why): For me every single other derby player is an inspiration. But apart from that I really like to watch the strong play of Stefanie Mainey. Best Derby moment: The minute right before my first scrimmage against another team I was extremely nervous but then I heard “Five seconds” – focused – and loved roller derby even more!